Thousands of cenotes (pronounced say-no-tay) dot the Yucatan Peninsula in Mexico. These are natural sinkholes in limestone bedrock, some are underground, some are open-air and some are a combination of both. Each has its own unique features and no two are the same. Before our time in Mexico, we hadn’t heard of cenotes; this soon changed though when we arrived in Puerto Morelos. Puerto Morelos is the gateway to the Ruta de Los Cenotes, a road with cenotes scattered either side of it in the jungle. Keen to visit at least one cenote my ears pricked up when someone in my yoga class mentioned the tour they’d been on with Layla Guesthouse to visit Choo Ha Cenote. A couple of days later we were thrilled to get an invite to join their next tour. 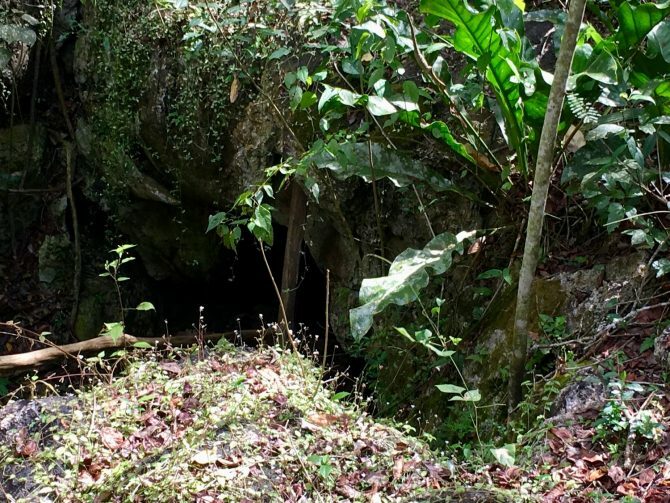 Layla Guesthouse provided us with a complimentary Cenote Tour which I’ve reviewed below. Read our full Product Review Disclosure here. Robin the owner of Layla Guesthouse created the Mayan Experience Cenote Tour in conjunction with the same Mayan families that helped build Layla Guesthouse. They became friends and one day whilst Robin was visiting their Mayan village, they showed him the cenote they had discovered. The idea for a Choo Ha Cenote Tour was born and the rest is history. 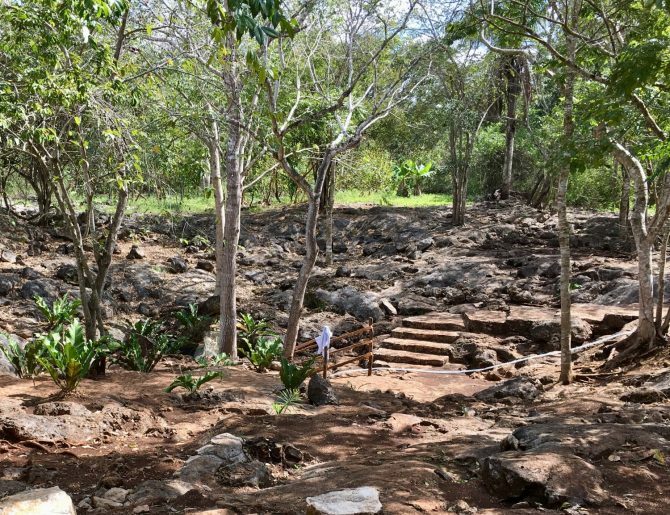 Now Layla Guesthouse and the Mayan families work together to enhance the facilities at the cenote and to deliver the tours. 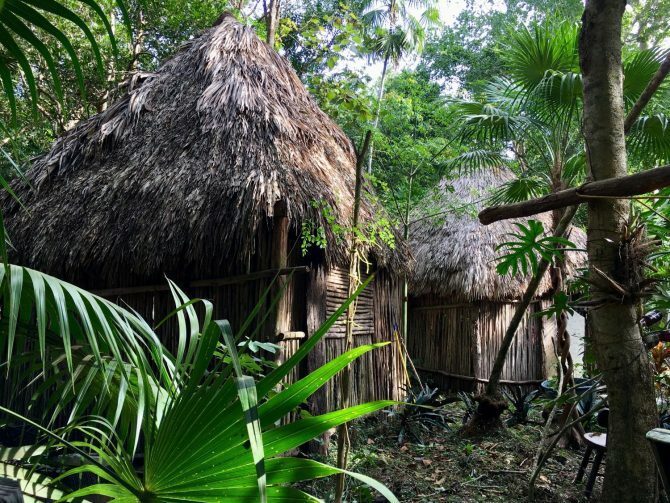 Layla Guesthouse helps support the Mayan village from the profits and contributes to the Cenote Green Development Fund. At about 8 am we went to Layla Guesthouse to meet the other people on the tour, Robin and our guide Paz. After a quick (very good) cappuccino for 50 pesos (£1.95), then at 8:30 am we all piled in a minibus ready to start the tour. It was a 20-minute drive along the Ruta de Los Cenotes to our first stop, a wood carver’s compound. As we drove Paz gave us an overview of day’s itinerary and shared some history and information about the places and things that we passed. The wood carver’s compound was set back from the road in the jungle. Paz and Robin showed us around and told us lots of interesting history about it and it’s people. The wood carver’s compound used to be the home to chicleros families. Chicleros were men who extracted tree sap to make chicle (chewing gum), the principal product of this area in the 20th century. Following the invention of synthetic chewing gum, the trees were used for lumber instead. 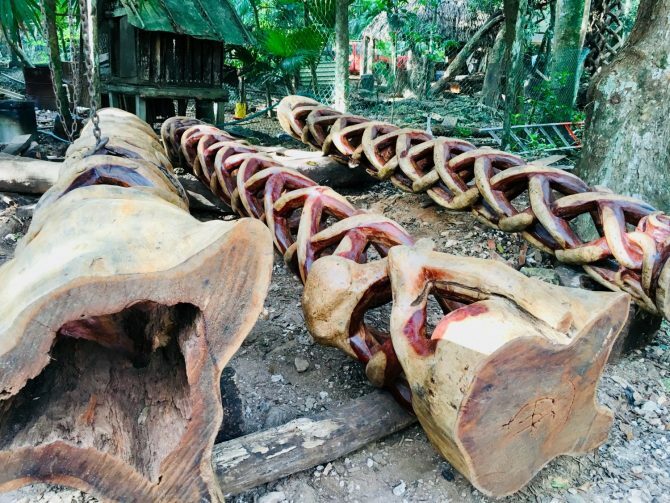 Nowadays, the main products of the compound are beautiful wood carvings. We learned about the trees used by the carvers and many other facts about the compound, the surrounding jungle, and the people that live and work there. It’s now the home to four generations of one family that live in 10 houses. We had plenty of time to admire their beautiful creations; some of the larger pieces were commissions for big hotels in Cancun and Playa and were very impressive. Many of the smaller pieces were available to buy in a little shop at the end, although there was no pressure to do so at all. Back in the minibus, we continued our journey. We went through several villages including Leona Vicario and San Cristobal. As we drove Robin told us more about Choo Ha Cenote, or Choj Ha as it’s also known, and their past and upcoming projects there. Soon they’d be installing solar panels to save energy. Paz then kept us entertained for the final stretch with a Mayan language lesson. We got to practice a few phrases at a local shop where we stopped for drinks and snacks. After an hour or so we arrived at Choo Ha Cenote which is in Xcan, in the state of Yucatan, not far from the Coba ruins. Leaving our bags under a palapa near to the cenote we first took a walk through the jungle. As we walked Paz and Robin shared a whole wealth of information on the flora and fauna of the jungle. They explained the uses of many of the plants and trees we saw. Some are used in construction and many have medicinal properties; it was like walking through a jungle pharmacy. I was especially interested to learn about the bird’s nest fern, which Mayans use to treat bad backs. I regularly suffer from lower back pain, so I made a mental note to try out this natural cure. We also learned lots about Mayan history and culture, which was fascinating. After an easy 20-minutes of walking, we found ourselves at the entrance to a dry cave. Guided only by torchlight, we climbed down the stone steps into the cool darkness. 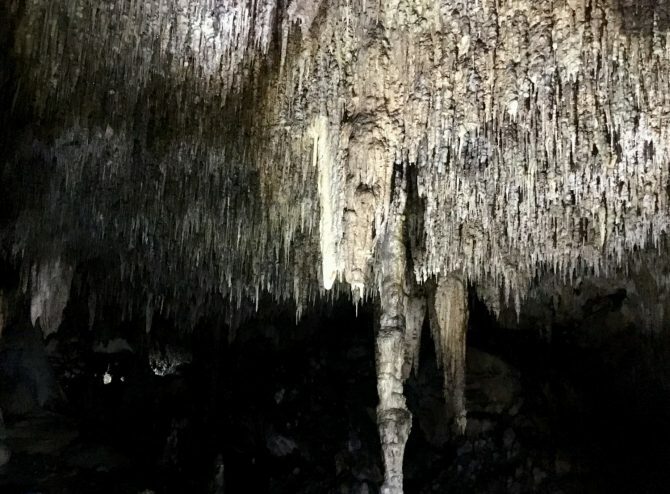 Surrounding us were thousands of stalagmites, stalactites and other shimmering limestone formations. Some of the stalactites looked very sharp and I had visions of one spearing my head, that would be just my luck! Robin and Paz guided us through the cave pointing out things of interest and telling us how the different formations came to be. They were always ready to give a helping hand to anyone that needed it when the ground became a little slippery. When we emerged from the dry cave it was another 20-minute walk back for the highlight of the day – swimming in Choo Ha Cenote. First, we had a refreshing coconut to rehydrate after our walk; they cost 20 pesos (£0.80 GBP) each, then it was time to get ready. We changed into our swimwear and had a quick shower to remove any sun lotion and insect repellant. We’d all taken Robin up on the offer of life-jackets to make the swim easier and snorkels and masks so we could see what lay beneath the water. Most of us also had some type of water shoes on which I’d recommend as some of the rocks can be a little rough or sharp. We made our way down the limestone steps into the dark cavern, looking to the left as instructed by Robin ready for his ‘surprise’! The light suddenly flicked on to reveal a spectacular scene. 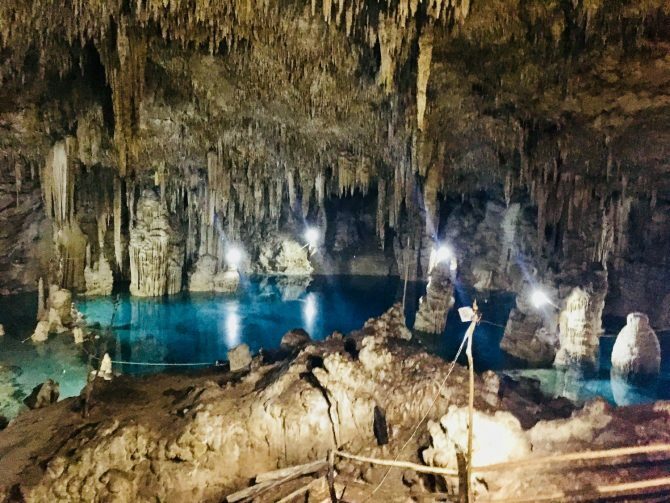 Sparkling stalagmites, stalactites and more limestone formations reflected off the bright blue, crystal clear water, all lit up beautifully by strung lights. Following Robin and Paz we tentatively dipped our toes in the water – it was freezing. There was only one way to get in and that was as quickly as possible. The shock of the icy water took our breath away but once we started to swim we soon became used to it. Robin swam and snorkelled ahead of us to guide us to all the best nooks and crannies. The view beneath the water when snorkelling was just as incredible as the view above. Although the water was very deep, it was so clear you could see all the formations; it would make for a great cave dive. It’s incredibly hard to do the beauty of this cenote justice with words and photos…you really just have to see it for yourself. Still awestruck by our swim in Choo Ha Cenote we dried off and changed ready for lunch in a nearby Mayan village. Before leaving a few of the group bought some Mayan honeybee products. There was honey, face cream, and immune booster each for sale for 200 pesos (£7.75) each. It was a short drive to the Mayan village where the family greeted us warmly with beaming smiles as they invited us into their home. Before we could have lunch it was time to help ‘Grandma’ make the tortillas. She was sitting at a low table by an open fire deftly patting the tortilla dough into discs before throwing them onto a flat pan to cook. 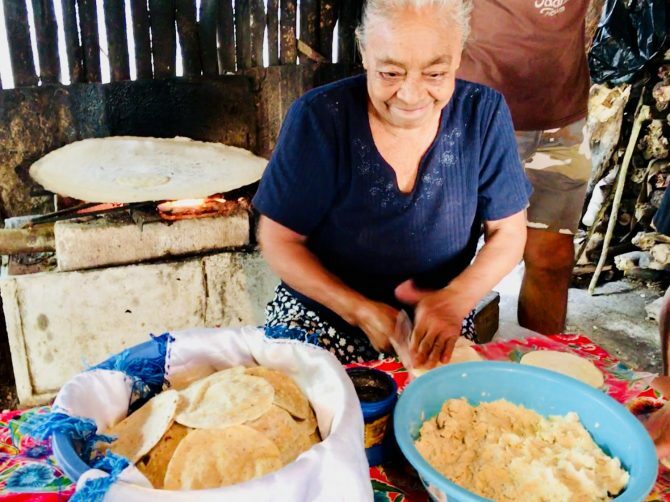 She’d been hand making tortillas for over 60 years so was an expert. Not so much could be said for us when it was our turn to give it a go – mine ended up with holes in it. Finally, it was lunchtime and after all our exploring we were starving and ready to eat. We all sat down at a long table as the family bought us out dish after dish of traditional Mayan food. 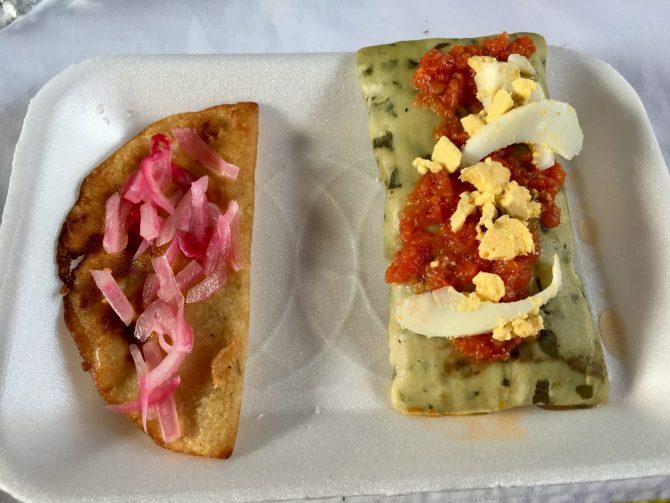 We had a tamale de chaya (spinach tamale), an empanada, tortillas, sikil pak(pumpkin seed dip) and a fiery hot salsa nicknamed ‘liquid fire‘. 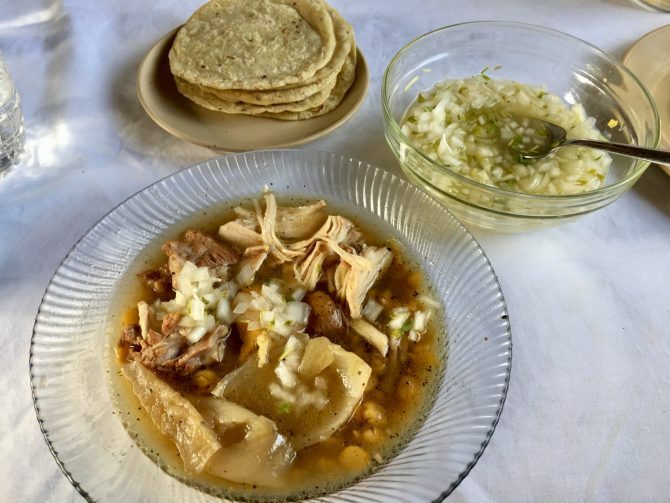 This was followed by the main event – the most delicious machado de pollo y cerdo (Yucatecan chicken and pork stew). This was all washed down with a beer or soft drink. It was so tasty, the best food we’d had in Mexico so far. After we’d finished eating one of the young girls of the family showed us some traditional embroidery and bead bracelets they’d made. I couldn’t resist buying myself a little bracelet in the colours of Mexico; it was only 50 pesos (£1.95). Completely stuffed full of amazing Mayan food we all piled back into the van for the 1.5-hour journey back to Puerto Morelos. It didn’t take long before most of us were sound asleep exhausted from our long, busy day. 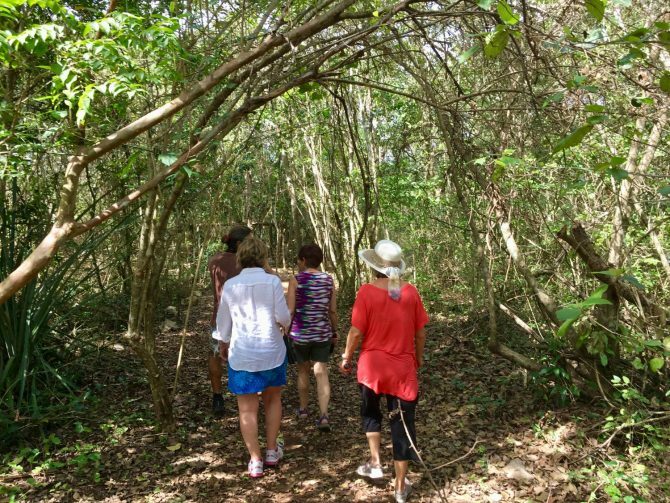 The price of a Mayan Cenote Experience Tour with Layla Guesthouse is 1,700 pesos (£66) per person (you’ll join a small group of other people). It takes place every Thursday, leaving at 08:30 am and returning to Puerto Morelos at about 5 pm. If you’d prefer a private tour (4 – 10 people) it costs 2,000 pesos (£77.65) per person and can be arranged for a different day. This unique, intimate tour was a fantastic way to visit one of the lesser visited, most stunning cenotes. There were only two other people at Choo Ha cenote at the same time as us and not a tour bus in sight! What made the tour especially memorable was the enthusiasm and in-depth knowledge both Robin and Paz had about everything we saw and did. They are clearly passionate about all aspects of the tour and this shone through adding real value to our experience. Andy and I aren’t huge ‘organised tour’ people but we’re so glad we had the opportunity to do this one the Mayan Experience Cenote Tour. It’s an absolute ‘do not miss’ when you’re visiting this part of Mexico. We loved it and from what Robin was telling us it’s only going to get better! Have you visited any cenotes in Mexico? 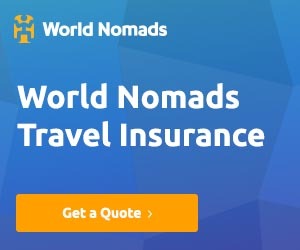 Which did you visit and how was your experience? 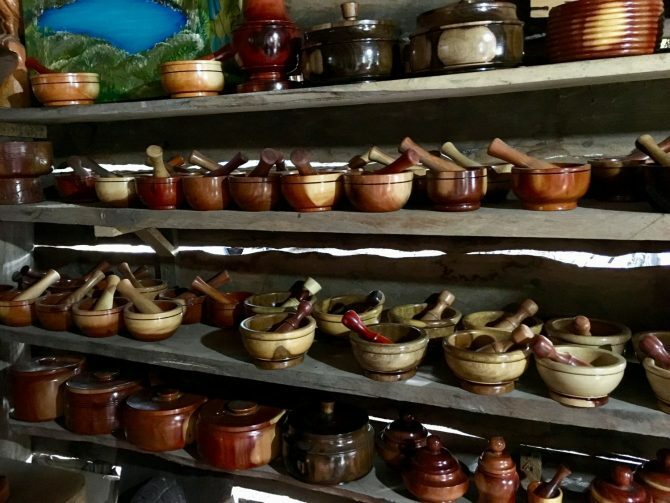 Product Review Disclosure: Layla Guesthouse provided us with a complimentary Mayan Cenote Experience Tour. This did not influence my post in any way and as always I’ve provided a balanced and honest review. Ahhh! That sounds like such a great tour! 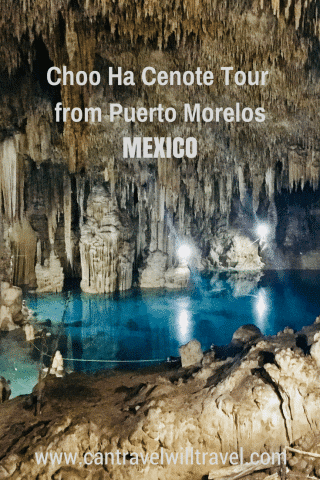 I’ve never heard of the Choo Ha cenote but I need to check it out! Wow, so beautiful! I´m looking forward to my cenote tour tomorrow. I hope I can come back to Mexico and explore more of them!